Arrogance is a core design principle. We designers take pride in our ability to bring about improvement from a critical—but constructive—perspective. The discerning eye is part of who we are. And while sometimes designers create new ideas and products, often our job is to improve someone else’s idea. Design at its core is about taking something and improving it—making a webpage more persuasive, an object more usable, or a brand more attractive to a specific audience. Design is essentially an arrogant effort. We’re often taking another person’s idea and telling them what to do with it. Somehow, people agree that the perspective of design, even if it’s a little arrogant, is worthwhile because design does improve products and communication in all kinds of measurable, valuable ways. But arrogance is core to design for another reason; all creative work requires at least a little arrogance. If you’re not arrogant enough to believe in your early, unproven ideas until you can develop and refine them, you’ll never make it as a designer or creative professional. I hope this doesn’t sound overly alpha-male of me, but you need a voice inside you that believes in your ideas, even when they’re not great at first. That is the definition of arrogance, right? But it’s an important tool because it allows us to persist past the early doubt and keep making progress. So while arrogance can surprisingly be a worthy virtue, it sometimes gets a little bit ahead of us. Designers have a certain reputation for being arrogant. Arrogance—as perceived by others outside our private design enclaves—obviously has downsides. Review and critique are important parts of design. We designers are constantly critiquing, evaluating, and revising our own work. Criticism is part of our internal monologue. While this all seems normal to designers, it can look an awful lot like arrogance to non-designers. Non-designers are less comfortable with criticism. When we take their ideas and begin our usual process of refinement and improvement, they can feel insulted. And they can see us as arrogant. Some of us adopt rules about giving feedback such as “Always say something nice first, before you criticize”. These kinds of approaches can help a bit (even if some designers resent this advice because it’s like telling us our perspective isn’t valuable unless we temper it). As we gain more experience, designers learn to manage this perception and find more friendly ways of working with others without sacrificing our expertise. We bridge gaps by learning about other professions: we learn to code, write, and research. We learn about the businesses and people we work with. We translate their concerns into design terms. We learn to explain design in a way people can understand and even value. But, what if non-designers are still right, and we are a little arrogant? After all, when we get a taste of our own medicine and people criticize our work the way we do to others, we get upset. We get frustrated when people criticize our work because it feels like they’re trying to tell us how to do our jobs. It’s one thing for another designer to criticize your designs, but it’s a totally different thing when it’s a non-designer. They don’t know the rules, the methods, or understand the work and attention that goes into each detail. People ask for changes that seem minor to them, but to us, it’s like telling an astronaut how to walk on the moon. But the sensitivity we have when getting design feedback from non-designers reveals something important—that our arrogance might have gone too far. As I said, it’s okay to be a little arrogant about your creative work. It’s actually essential. But, if you allow that arrogance to unchecked, it can jeopardize the relationships with people who you need in order to keep making design (and who hopefully you want a healthy working relationship with). A few years into my career I got hired at an agency where I probably had 5 (maybe 10?) years’ less experience than all my coworkers. Just guess how I responded to this. For the first few months, I couldn’t believe they didn’t fire me, but I tried to act like I knew what I was doing. The agency’s way of working was so foreign to me, and I remember one time not knowing what I was supposed to do, so I just made up some fake copy for a display ad I was apparently supposed to make. We had full time copywriters on every project, but I thought I’d impress everyone by doing it all myself. And then a copywriter ended up with me in the meeting with the creative director, the CD hated the work, and the copywriter got blamed for it. I still regret that one. Later in my career, at a different job, I was the hotshot designer who got picked for all the cool projects at our agency (or that was how I saw it). I was impatient when other designers reviewed my work or when I was asked to collaborate with them. I often tuned out during design team meetings, just waiting until I could get back to my desk to work my magic. This culminated when a coworker flat out accused me of being uninvested in our projects in an email to my boss. And, I realized he was right. At this point, you’re probably thinking that I’m a horrible person to do these things. And, you’re right—at the time, I was. I wish I’d gotten my serving of humble pie sooner. 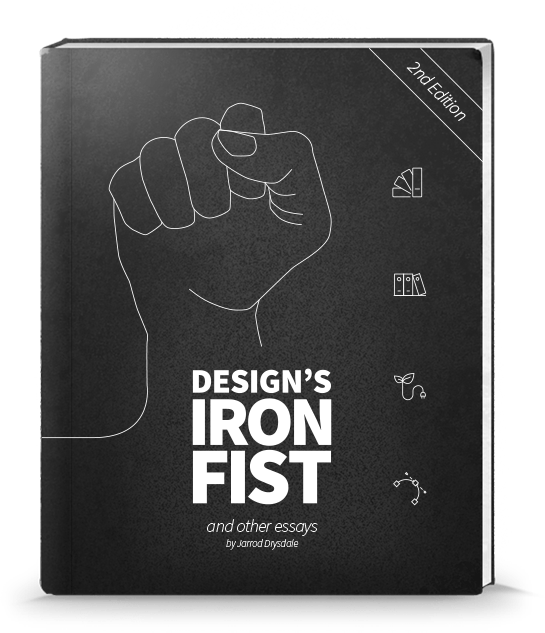 But I share these stories because I think all designers wage this war between our good intentions and our necessity to arrogantly fight for our creative concepts. Sometimes, the war goes the wrong way, and we deserve the reputation for being arrogant. You’re not a designer unless someone is hiring you to make design. And while you do need a little arrogance to be a designer, if you have too much, no one is going to want to work with you. You aren’t a designer without the people you work with. We need the right amount of arrogance. Most designers struggle with figuring out what the right amount is. Often times, I feel I’m either a raging ego-beast trying to enforce my vision upon everyone or a total yes-man pushover who caves to every request. It’s hard to find a moderate middle. But the times where I am able to strike some balance, I find that people warm up to my perspective, and listen to what I have to say. When I let my arrogance run wild, I end up doing more revisions and feeling more frustrated. When I let everyone else get their way, I end up doing low quality work. But when I balance the two, I do my best work. I’m able to defend the important aspects of my work while opening myself up to outside perspectives that often also improve the work. It is a constant search, but the result is worth it. The right amount of arrogance makes for great design.